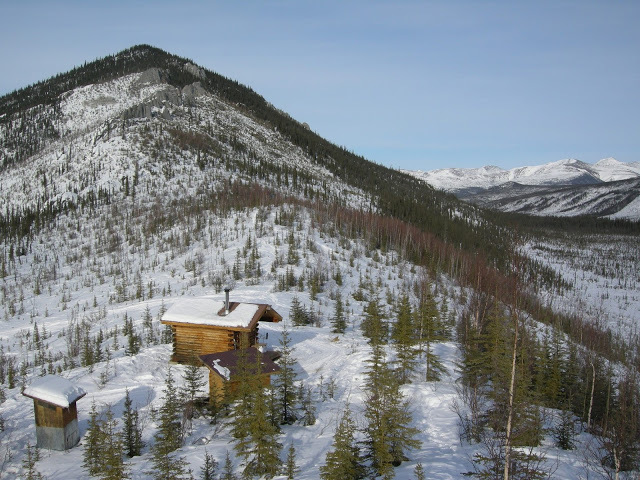 Ever in search of accessible hut to hut ski trips, I stumbled upon a blog article about the White Mountains National Recreation Area north of Fairbanks, Alaska one day last fall. This March 2016, I had the good fortune of spending 7 days there with my husband Fred and my friend Shirley. The recreation area has cabins for rent, each about a day’s ski apart along a rustic trail. While the scenery is lovely and even dramatic, it’s not so steep that you need any avalanche know-how or gear to safely ski the route, one of my main criteria. It’s a playground for residents of Fairbanks and surrounding areas. Almost no tourists seem to make it up there, opting instead for more classic Alaskan destinations such as Denali. This recreation area is only about 100 km or so south of the Arctic Circle. Being in a subarctic environment felt suitably exotic. We happened upon snow-white ptarmigan from time to time as we skied through the spruce and birch forests. It was light from 7 am till 9 pm. We pined after the typically spectacular northern lights though this wasn’t to be for our otherwise perfect trip. The weather was ideal, with bright sun and below-freezing temperatures. A few inches of fresh snow fell just before we arrived, supplementing the sparse two feet that had been there since late November. All in all, we experienced the best landscapes, snow conditions and weather of any hut to hut ski trip I’ve ever done. Lucky us! We flew to Fairbanks via a long, circuitous route on Friday March 18th. The Bureau of Land Management (BLM)’s friendly staff had advised us to avoid the university’s spring break, which was the week before our trip. Otherwise, March and early April are the best times to go, since the days are getting longer but there is usually still enough snow. By mid-April, it’s usually no longer possible to ski the route. And in other seasons, the route is boggy (and buggy) enough to deter most people. We spent the next day buying food for the trip and repacking our packs. This was my first backpacking trip carrying 7 days of food and everything we needed to be self sufficient, so I was apprehensive about the weight. Upon my insistence, we ate nothing but freeze-dried meals, Cliff Bars and oatmeal, which were the lightest and most compact options, though not everyone found this regime to be wholly satisfying. We brought emergency gear in case we got caught between cabins and had to sleep outside. The BLM recommends bringing a tent, but we settled on a tarp, bivvy sack and shovel. The cabins have propane stoves, so we carried a bottle of propane in addition to our own compact camp stove and fuel just in case. On Saturday night, thanks to Shirley’s keen scoping, we took part in a traditional Gwich’in fiddle and jigging evening in the Cultural and Visitors Center. The recreation area is in the heart of Gwich’in First Nations traditional land, which straddles Alaska and the Yukon. And Sunday we finally started the trip itself, after months of planning and thinking about it. We drove up early in a rental car, about an hour and a half to our trailhead at Colorado Creek. 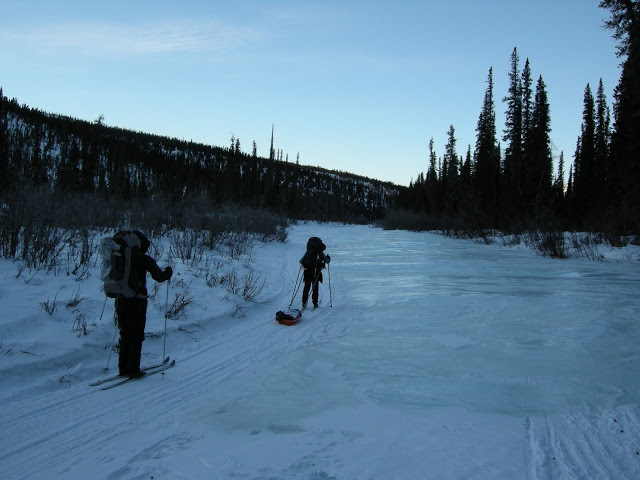 It’s also possible to access the trails a bit closer to Fairbanks depending on the trails and cabins you choose. Sunday was our hardest day. Our packs were at their heaviest as we slogged along for nearly 14 miles slightly uphill. We gained 800 feet in elevation that day. The trail conditions were great with the new snow. They are groomed (but not track set) from time to time by BLM snowmachines. Shirley divided the weight between her pack and a small pulk (sled) lent by a very kind local guide. Fred and I opted for crushingly heavy packs. We all brought minimalist equipment. Along the way, we admired what we thought were lynx tracks along the trail. Our route. The parking and trailhead is 57 miles north of Fairbanks. Thanks Fred for the map! Exhausted after 8 hours of skiing, we finally reached Colorado Creek Cabin at 6 pm, a welcome sight at that point. The cabins are compact, cozy, well-built log structures, with a wood stove, bunks, and a picnic table. They are not expensive: it currently only costs $25 US to rent the entire cabin for a night, though fees are set to increase soon. Renting the entire cabin is the only option. To reserve, you need to call the BLM no more than 30 days ahead of the date of your first cabin. You can then rent 2 subsequent cabins, and need to call back 3 days later to rent any others. I called literally the minute the BLM opened when the date rolled around, and was extremely fortunate to get all the cabins we wanted, which is somewhat rare because they are in hot demand. We didn’t book our plane tickets or do much planning until we knew we had our cabin reservations. The tricky reservation system favours local usage… as it probably should. The view from inside Wolf Run cabin. We put down our packs and turned our attention to various necessary tasks around the cabin. Chopping and sawing wood and gathering kindling was first on the list. Wood is not provided, but self-sufficient Alaskans don’t balk at the task of wandering into the forest, cutting down a tree, hauling it back to the cabin and transforming it into a neat pile of split logs after a hard day of skiing. The many forest burns that we skied through are a great source of firewood. The trail is multi-use; snowmobilers staying in the cabins will often take it upon themselves to haul in chainsaws and cut down trees to get the process started, leaving the finer sawing and chopping to the skiers, mushers, skijorers and fatbikers. Everyone seems to get along perfectly and people really take ownership of the cabins, leaving them clean and well-stocked. I’ve never seen cabin log books with so many faithfully recorded visits. This made for some entertaining reading! 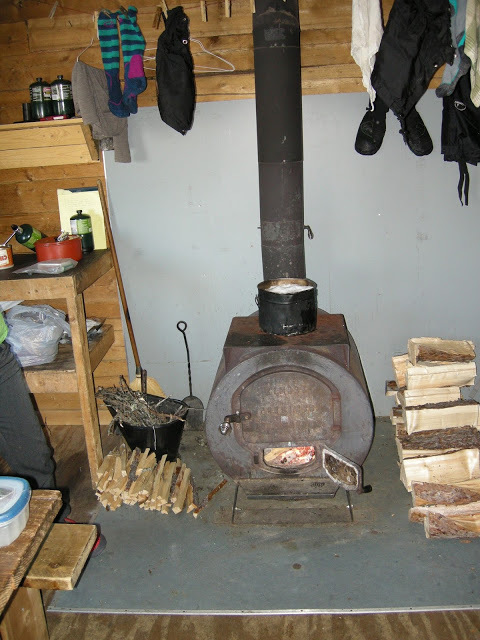 Once we got a fire going in the wood stove, we went out to collect some clean snow for water. We then spent the evening melting snow on the stove and boiling water for various instant soups, meals and hot drinks. On Monday we had a shorter ski (10 miles) to Wolf Run Cabin. We got there through an apparently typical head wind. The aptly-named White Mountains began to appear. We crossed several narrow bridges as well as the well-frozen Beaver Creek. Wolf Run was my favourite cabin in terms of construction. Sunny and bright, it has a “picture window” that frames one of the nicest views, complete with a near-full moon rising above the hills. There is lots of room for people and gear. 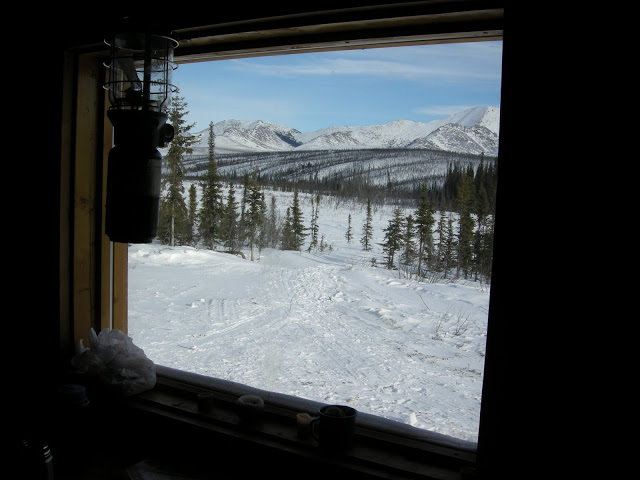 Even the outhouse has a great view if you leave the door open. Since we hadn’t seen anyone else in 48 hours, we dared to take advantage of the view! The next day we headed uphill toward Windy Gap. We saw some snow-white ptarmigan and enjoyed the sunny, still weather. We admired moose poop and fox tracks. Ice covered part of the trail. This was my first encounter with the arctic and subarctic phenomenon known as overflow, or aufeis. Meaning “ice on top”, aufeis can happen when groundwater discharge is blocked by ice, or when lake or riverwater backs up under an ice layer. It can result in layers of water between layers of thin ice. It is quite common for skiers to get their boots wet in ice-cold water as a result. We were apprehensive about the possibility of overflow and carried many plastic bags, extra socks and even neoprene booties just in case. But this ice was well-frozen. The view all around us became increasingly dramatic as we skied up into the heart of the White Mountains. Jagged limestone spires topped the mountains and we witnessed the formation that gave Windy Gap its name. This limestone formation is rare for Alaska. We climbed a ridge, took many photos, then barreled down the steepest downhill of the trip until we reached Windy Gap Cabin. This compact cabin is located right along a blue-green frozen creek, surrounded by mountains and lush spruce trees. It reminded us of the Canadian Rockies! Early that evening, 3 BLM staff members came by on snowmachines, including Eric, who had patiently answered our many questions prior to the trip. They were grooming the trails for the upcoming annual 100-mile race in the White Mountains, which people do on skis or fatbike. The fastest skiers manage to complete the tour in 11 hours! On Wednesday, we left Windy Gap Cabin to ski along Fossil Gap Creek. As we skittered along the sheer ice, we were truly thankful it was well frozen. The trail then went into a forest of thick spruce, and weaved in and out, crossing the creek several more times. We encountered one slightly more difficult crossing of sheer ice on a steep angle with a wet-looking spot at the bottom right. Fred tried bushwhacking uphill of the crossing, but ended up sinking through the snow down to water underneath, opening up a tiny rivulet that started running down the ice, exacerbating the initial problem. The rule of thumb of overflow seemed to be to always stay on the groomed trail since it’s the hardest packed – that’s where you have the best chances of a dry crossing. Snow around overflow tends to be saturated. Though the snow was not much more than 2 feet deep, whenever we went off trail, we’d sink in to our knees, right to the ground! I think the snow was so dry that it never settled and compacted, even after months on the ground. For a while after that, skiing went smoothly. We came to a fun downhill, a gentle slope with a dizzying plane of spruce trees in the foreground and mountains behind. We arrived at another river crossing with strange limestone formations, and climbed up a last, long hot hill on this big, 12-mile day, all the way up to Caribou Bluff Cabin… and another incredible view! On the ridge just above the cabin, we could see the mountains for miles all around. This was the tiniest of cabins, built snug like a ship’s hold. Again the outhouse was a room with a view. We set about chopping and sawing wood, marveling again at these Alaskans built so strong they could prepare so much wood after a tiring day’s ski. After sunrise on Caribou Bluff, we skied back down to Fossil Gap Creek and to our delight, the snow-covered trail stayed right on the frozen creek for some time. Fred saw a small gray owl, likely a hawk owl, that Shirley and I somehow missed, to our dismay. We skied through forest and across Beaver Creek River with no problems, though it had apparently been covered in a foot of water at this crossing the week before. Downstream, flow increased and the trail followed along in the forest above the open river. It looked like a lovely canoe trip with the mountains all around. We admired yet more tracks in the snow: snowshoe hare, marten, moose, and perhaps fox and wolf, in addition to the many dog team and human tracks. We skied through the more open Beaver Creek Valley, seemingly endless expanses of shrubby spruce and snow, with mountains all around the edges of our view. And surprise, we arrived back at the sign for Wolf Run Cabin, to which we were returning on Thursday evening. The distance seemed shorter than the 12 miles indicated on the map. No matter, we were happy for the easier day and even had time and energy to walk up the hill to the view behind the hut and play a competitive game of Scrabble. Friday we skied back to Colorado Creek Cabin and the miles went by fast. We met two fatbikers heading in the opposite direction with all their gear for a 3-night stay. They later came back, having changed their plans since the fresh snow was slowing them down and making it hard to reach the cabins they had booked. We arrived early at the cabin and had time to ski around, bask in the sun in front of the cabin, and build a shelter to test our outdoor sleeping emergency set up. We put our sleeping bags and mats inside a bivvy sack, under a tarp, surrounded by a snow wall. It worked well but it wasn’t all that cold that evening. Saturday was our last day on the trail. Our packs were lighter, the snow was fast and the trail was mostly downhill. The miles sped by. Shirley whipped down a technical downhill (of which there are few), managing to stay more or less in control despite the slightly icy conditions and her pulk pushing from behind. We encountered a wild-bearded skate skier named Jim, his partner Melly on a fatbike, and their two dogs, which struck us as a typical mixed-use group for this area. In no time we were at our car, much earlier than anticipated. On the drive back to Fairbanks, we returned the pulk to its owner, had a chat and discovered he’s the president of the Fairbanks Paddling Club. He showed us his many exciting kayaks, including an inflatable Alpaka that can fit in a backpack and be part of a lengthy paddling-hiking excursion. The spirit of adventure and exploration in Alaska left a great impression on me. AND, we had time to drive to the Chena Hot Springs, a popular resort with its own road, greenhouse and restaurants, for the best post-trip shower and rejuvenating soak! It features a couple of indoor pools and hot tubs, and a large outdoor pool surrounded by boulders and filled with international visitors taking selfies. Bring your own towel to save $5! There were other tantalizing hot springs in the area but these required hiking or skiing in 10 miles or so, such as Tolovana Hot Springs. There are cabins for rent here, and another time, I’d definitely leave extra 2 days to enjoy these more remote springs. But we were thrilled we had the chance to visit any of them! And so ended an inspiring adventure that went better than we imagined possible. The images will stay with us for a long time. Everyone we met was warm, generous and kind. 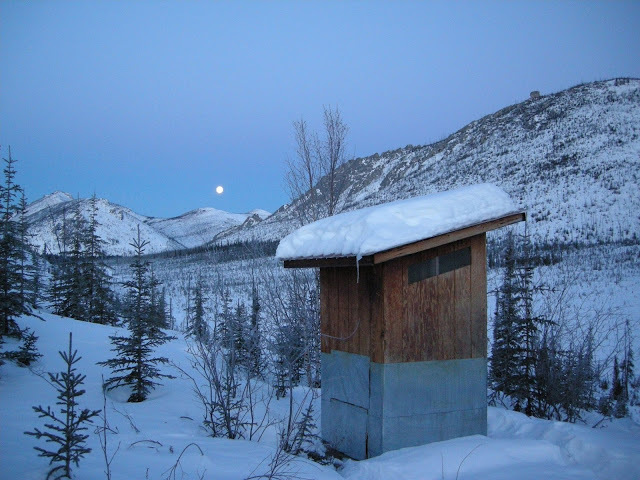 This hut to hut ski route would appeal to cross-country skiers in search of moderate yet not extreme adventure, a taste of what “everyday” Alaskans can enjoy. – There are a couple of other trailheads. Wickersham Dome is a bit closer to Fairbanks: it’s at mile 28 of the Elliot Highway (versus Colorado Creek, which is at mile 57). This trailhead allows access to cabins that are a bit closer together, but that are a bit further from the most spectacular scenery. In the past, there have been reports of vandalism at the Wickersham Dome parking lot. – Rental cars in Fairbanks come with plugs to save the battery in extremely cold weather. If the forecast is very cold during your trip, it might be worth looking into how to leave a car at one of these trailheads without being able to plug it in. – Be prepared for bad weather and getting caught outside. Weather can be extreme in this region. Snow conditions and overflow can change daily. Weather is considerably colder than in Fairbanks. Valleys may be colder than ridges. In March-April, there can be spring snow conditions, with hard-packed, icy snow in the mornings, and “sugar corn” snow in the afternoons. – Avoid Summit Trail Shelter except for day trips – the trail is not always broken and there is no easy source of wood. – There is no cell phone reception in this recreation area. Be sure to carry a SPOT and/or satellite phone. An example of a satellite phone rental company is: http://www.fairbankssatphone.com/. In case of emergency, contact the Alaska State Troopers at 1-907-438-7200. – There is no baggage transportation service in this recreation area. Renting a car is the most obvious way to get to and from the trailhead. No official shuttle service exists. – Be sure to buy propane bottles that are compatible with those in the cabins (the green 1 pound bottles). There are 2-burner Coleman stoves in the cabins. Equipment in the cabins is not verified on a daily basis so be sure to have a backup. You can also bring propane bottles for the Coleman lamps if you don’t mind carrying them. – Bring a mini folding saw. Saws and axes are provided but again, are not verified on a daily basis so could be broken. – There is not necessarily a big pot in every cabin. We bought a folding cloth bucket at REI to facilitate “snow melting operations”. There is an REI store in Fairbanks for any outdoor gear you might need. – Bring a camping mattress. 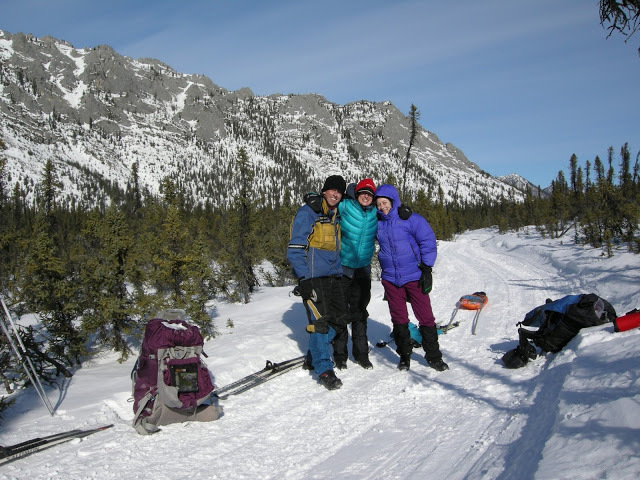 – We appreciated having sturdy backcountry skis (not excessively wide) with metal edges in case of ice, but many people do this route on classic or even skate skis. – You can consult the snow depths at the following website: http://ambcs.org/SiteViewer.shtml. There is a drop down menu under « Telemetry site to view ». Scroll down to « Upper Nome Creek » and select it. This is the only automated site in the White Mountains. The site is in the southeast portion of the recreation area. To see the snow depths in Fairbanks, on the same site under the telemetry view, select « Fairbanks Field Office ». Starting skiing early in the morning when temperatures are lower could help with avoiding overflow, although it seems to happen when it’s cold too. – You can call BLM at 1-907-474-2357 (Eric, for detailed information and advice). To reserve huts, call 1-907-474-2251. BLM will e-mail your permits to you. For the best chance at reserving a cabin, call at precisely 7:45 am Fairbanks time, or even dial at 7:44 am, exactly 30 days before your first overnight. Consult BLM beforehand to make sure you’ve calculated this correctly. There are no refunds. Cabins can house 4 to 6 people typically. According to BLM, the week right before spring break might be the optimal week, because it’s a bit less popular, and therefore easier to reserve cabins, yet the days are already getting fairly long. There is a 4 hour time difference between Fairbanks, Alaska, and Montreal, Canada. – BLM can also recommend professional guides to take you on these trips. 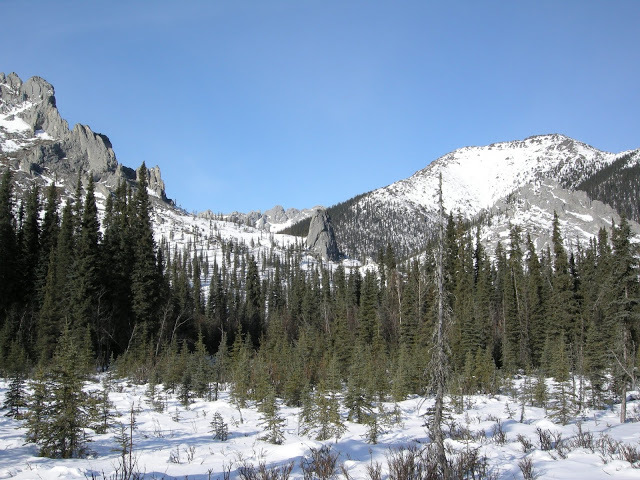 – It is possible to winter camp in this recreation area. There is no fee and no need to reserve. – Visitors are expected to always leave firewood and kindling inside the cabin, sufficient for the next person, in case of emergency. – Our route involved up to 800 feet of climbing in a day and 14 miles of skiing, but typically less. The shortest day was 9 miles long. – Ask the BLM to recommend a good topographical map. 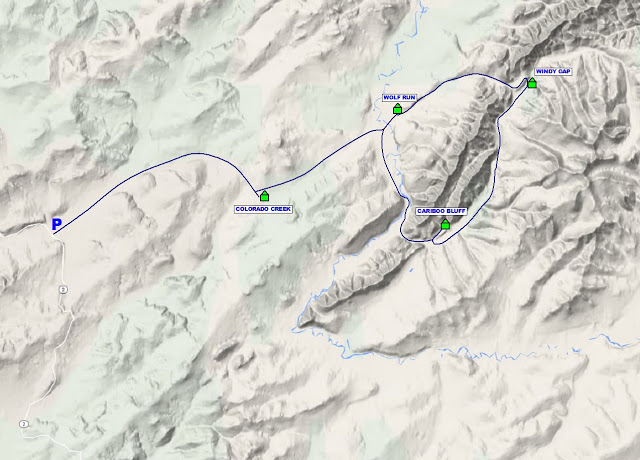 GPS coordinates of the cabins can be found here: http://www.blm.gov/ak/st/en/prog/nlcs/white_mtns/cabins/gps_coordinates.html. A basic trail map can be found here: http://www.blm.gov/ak/st/en/prog/nlcs/white_mtns/maps.html. If the route has been groomed recently, it will be easy to find the trail. If not, trail markers can sometimes be far apart. – We stayed at the Minnie Street Inn, which worked out well for us. It was comfortable and had a kitchen and fridge we could use. The owners were very helpful and flexible. There is also a youth hostel in town. – We’ve been told there is a reliable app that forecasts when the Northern Lights will be at their peak. – Gulliver’s is apparently a fun independent bookstore in town, but it was closed when we were there on Easter Sunday. – This trip cost us roughly $2000 CAD/person from Montreal, including all transportation, lodging and food. The US-Canada exchange rate was not favourable at the time. Previous articleProgrammation printemps 2016! Spring 2016 Program! Next articleRapport hiver 2016! Winter 2016 Report! Great article, Adrienne! It was a pleasure to meet, you, Fred, and Shirley. So glad you enjoyed such a grand journey in one of Fairbanksans' favorite "backyard" playgrounds.